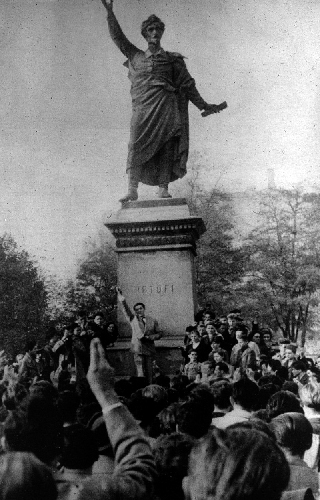 Imre Sinkovits read out the Nemzeti Dal („National Song”) at the pedestal of the statue of Sándor Petőfi on October 23th 1956, without amplifier, in front of the gathered tens of thousands of people. This event at the beginning of the revolution became a symbol of the whole movement. The actor of the Hungarian National Theater did not receive a prison sentence (his person attracted too much attention) but was regularly taken by the police for inquiries. First he could not play leading roles and his salary was halved. Later, after failing to make a statement of repentance at the Népszabadság journal, he became an assistant the Plastic and Textile Industrial Facility for half a year and he had to leave the National Theatre for five years. 60 years have passed since the events of ‘56. There are fewer and fewer eyewitnesses of the revolution among us. We can only get information on what happened in Budapest in 1956 only indirectly, through written text, images and recordings. 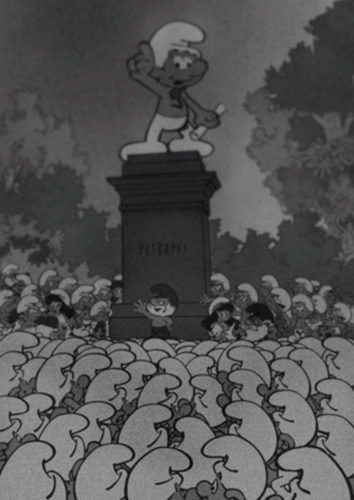 For the younger generations Sinkovits is most memorable as the voice of Papa Smurf, and nowadays he is rarely seen on TV in other roles. He lives on as an actor in our memory and his revolutionary acts gradually disappears from the public consciousness. I’ve transformed a picture taken at the beginning of the revolution of the aforementioned iconic moment, by replacing everyone with the characters of Smurf Village. What concerned me is what remains in public memory and how past events are transformed and relativized.